Established in Kyoto, MINOKICHI, continues to deliver the traditional taste of Kyoto cuisine for over 290 years. The modern influences of the next 2-3 will not effect our invariable tradition, but will orchestrate our business objectively a decade at a time. Not just from a business stance, but constantly increasing the cultivation of Kyoto cuisine of a 1200 year old dynasty is of more meaningful. Establishing a business that is rich in emotional satisfaction over material things is desired.  With this principle concept in mind, we continue the chase in achieving a space for smiles and happiness through culture and our prided Kyoto cuisine. MINOKICHI is famed as one of the oldest standing historical high-class Japanese restaurants in Kyoto. The MINOKICHI was originally founded by a dignitary named Jurobe Satake, descendant of the highly respected Akita Satake Samurai clan. Jurobe left his home land country of Mino, Ogaki which is modernly known as Gifu prefecture along the west coast of Japan and headed into Kyoto where he started a small traditional outdoor tea house or café commonly seen in the Edo period. The first tea house built along Sanjo Kawaramachi street, was the start of what we know today as MINOKICHI. After establishment, MINOKICHI has been acknowledged as one of the top 8 restaurants in Kyoto to serve the best freshwater fish cuisine by the Kyoto Shojidai (Local security enforcement) for 10 generations (doing business for over 290 years). Initially, as it originated from the land of Mino, it was called “Minoya” which means the shop of Mino. It was taken over by the heir of Jurobe Satake named Kichibei. He used to call the restaurant “Minokichibe” which eventually ended up being shortened as MINOKICHI, which is how it got its name. it is said that during the final days of the Edo era, ruled by the Tokugawa shogunate, a proprietress, named madam Rise, used MINOKICHI as a shelter for rebels of the imperial restoration. She protected saveral known names such as Teizo Miyabe, Matsuda Jusuke, Kuniomi Hirano, Shiro Fujimura, Kogoro Katsura and Juro Yamada. In 1950, the shop moved near Nanzen-ji temple which is said to be located near the resort villa of Ariwara no Narihira (A Japanese waka poet and aristocrat). Thereafter, by 1969, MINOKICHI was renowned as a legendary culinary establishment with a history of over one hundred years and was given an official commendation by, then governor of Kyoto prefecture, Torazo Ninagawa. By 1983, it was awarded the 5th Annual Minister’s Award for Overseas Promotion of Japanese Food by the Japan Food Industry Center.